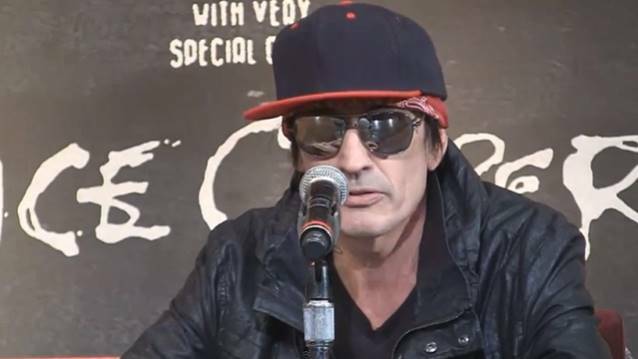 MÖTLEY CRÜE drummer Tommy Lee has gotten engaged to his longtime girlfriend, Sofia "Sofi" Toufa, also known by her stage name SOFI (acronym for SomeOtherFemaleInterest), a German singer and dancer now based in Los Angeles, California. "There comes a time in a mans life when you just know your partner is for LIFE!!" Tommy announced to his 430,000 Twitter followers. "Say hello to my fiancé and soon to be wife @SOFIofficial." This will be the fourth marriage for the 51-year-old Lee, who was previously married to model Elaine Starchuk and actresses Heather Locklear and Pamela Anderson. Born in Germany and raised within a Greek family, Toufa, 30, started her musical career at the early age of 13 through her group DANACEE, signed to Def Jam Germany. The band has supported acts such as DESTINY'S CHILD and USHER. Toufa later co-choreographed the video for Avril Lavigne's hit single "Girlfriend" and she was hired to co-choreograph, sing and dance on Lavigne's 2008's "Best Damn World Tour". In 2009, Toufa toured the world as backup singer for Britney Spears on her "Circus 2009 World Tour". Toufa has also worked with FALL OUT BOY, Will.I.Am, Butch Walker, THE VON BONDIES and Nelly Furtado. There comes a time in a mans life when you just know your partner is for LIFE!! Say hello to my fiancé and soon to be wife @SOFIofficial ?